DIAGNOSTIC FEATURES: Large, strongly wrinkled and pitted thallus; often with isidia and soredia; underside pale brown with irregular white spots, without cortical rim; compare with L. quercizans which is not reticulate wrinkled or pitted, apothecia common, and with Sticta beauvoisii, undersurface with white spots having a cortical rim. ECOLOGY: Distribution in the US is Appalachian-boreal plus mountainous areas in the West, on bark or rarely rock. 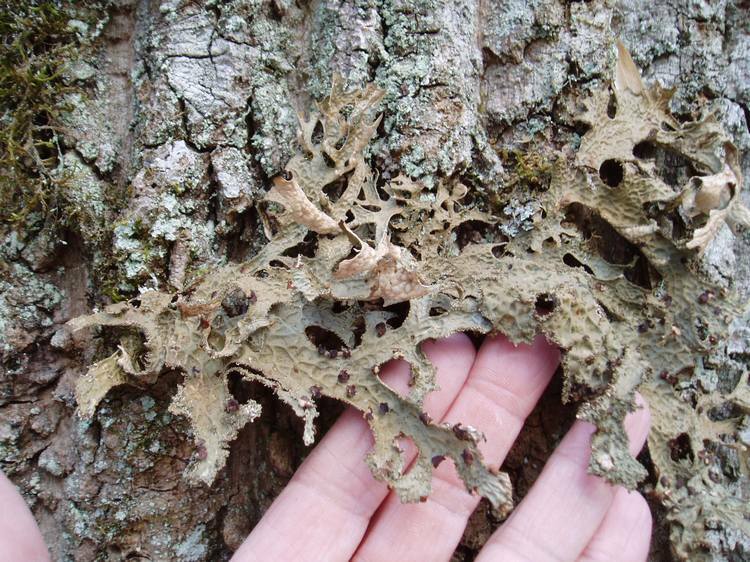 This large, distinctive lichen is usually found in mature or old-growth forests. There are old records from 14 counties, scattered across Ohio, but no recent records. Perhaps extirpated from the state.